Manuel Onate, the owner of MomSoft, has worn many hats during his career. He is a Civil Engineer, but has worked for most of his career as a financial and strategic consultant. Since 1995, he has spearheaded MomSoft, a software company focused on productivity add-ins for Windows and Microsoft Office programs. When he is not busy improving his software products, you can find him doing presentations and courses. In this conversation, Manuel talks about PowerTOC, a PowerPoint add-in that lets you create TOCs and more. Geetesh: Manuel, can you tell us more about PowerTOC, your PowerPoint add-in that lets you create summary agendas and tables of content. What motivated you to create this add-in? Manuel: All my products have been created out of a personal need. In the case of PowerTOC, I realized that having a table of contents at the start of the presentation, with links to all the slides on the deck, was very convenient when I started providing courses. I started using the Summary Slide function that PowerPoint used to have, but I decided to create an add-in the first time that my TOC was not synchronized with the presentation during a course. It was a little bit embarrassing. Over time, I added more and more features, until I realized I had a product and started selling it on my website. This is usually what has happened with all my products, but PowerTOC is special for me because it was my first Office add-in and after launching it, I decided to focus my development efforts on creating add-ins for Word and PowerPoint that I use every day. Lately, I have been providing more elaborated courses, sometimes lasting several days and my needs have increased. That is why I decided to improve the product. The new version adds Agendas and Section Tables of Contents. With Section Tables of Contents, you don’t have to split the presentation to include a Table of Contents for each Section of the presentation. Another important decision was to drop support for versions of PowerPoint before 2007. That way it is possible to take advantage of the new possibilities of recent versions of PowerPoint. The result is a more powerful and easy to use PowerTOC, especially with respect to formatting summary slides, which was something I wasn’t totally happy during the previous versions. Now all the formatting is based on placeholders on custom layouts integrated on the presentation template. This means that once you have customized the styles to match your presentation templates, you can usually insert a perfectly formatted agenda or table of contents in just two clicks. 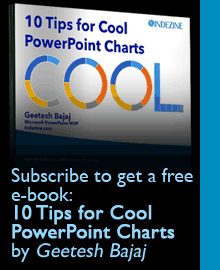 Geetesh: What is it that sets PowerTOC apart from other PowerPoint add-ins that create TOCs? Manuel: If you use PowerPoint to create printed manuals, as some of my clients do, and you need to have a table of contents that spans several slides, allows different indent levels and you want to retain invisible links to the individual slides in the PDF version of the manual, you need PowerTOC. There isn’t anything else available that provides all of these features. From what I have seen, most of the other add-ins that are available are very simple and are more suited to create what I would call a summary agenda of the presentation, with a few bullet points, one for each section of the presentation. There are a few others that have a set of features comparable to PowerTOC, but they are part of sets that include many other functions and are very expensive, usually with a monthly cost higher than the cost of the unlimited license cost of PowerTOC. If you just need TOCs and agendas, I think that PowerTOC is a better deal. All my products, including PowerTOC, are specialized and tailored to perform a single task in a very effective way. I do not create swiss-knife kind of applications. As a result, PowerTOC offers some unique benefits that improve the productivity of my users and have a very gentle learning curve. By far the most common feedback I receive from my clients is that my add-ins help them save time and avoid repetitive and error-prone tasks. This is not surprising because, as I said, they come from my own needs to automate everyday tasks. Many of the features of PowerTOC have been the result of the interaction with my clients, that have suggested me ideas of the kind “how did I not thought of that?” and are now part of PowerTOC.